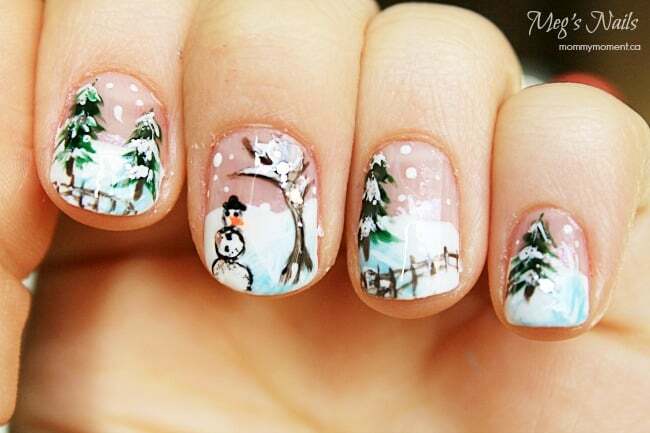 Enjoy this Winter Scene Nail Art all Winter Long! 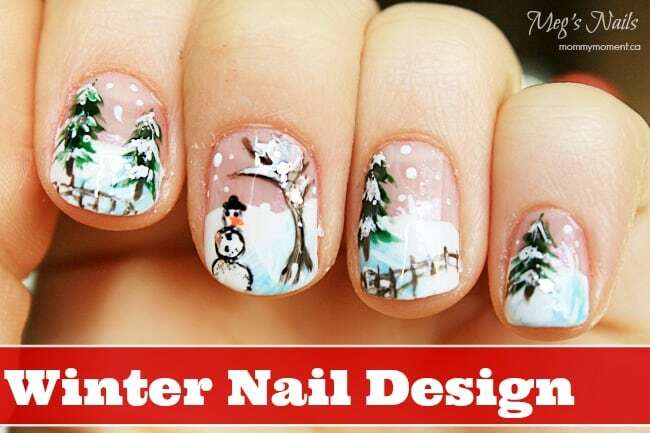 You are here: Home / Crafts / Enjoy this Winter Scene Nail Art all Winter Long! It’s December and that means all things winter and Christmas, and I am definitely okay with that. I can hardly believe we’re already into December but I am embracing it with open arms. Knitted sweaters, hot coco by the fire; we all have our own image of the perfect winter, and I know for some of you it includes not stepping outside for the next few months until it warms up again. Whether you like winter or not, I think we can all agree that this season is one of the most beautiful times of the year. 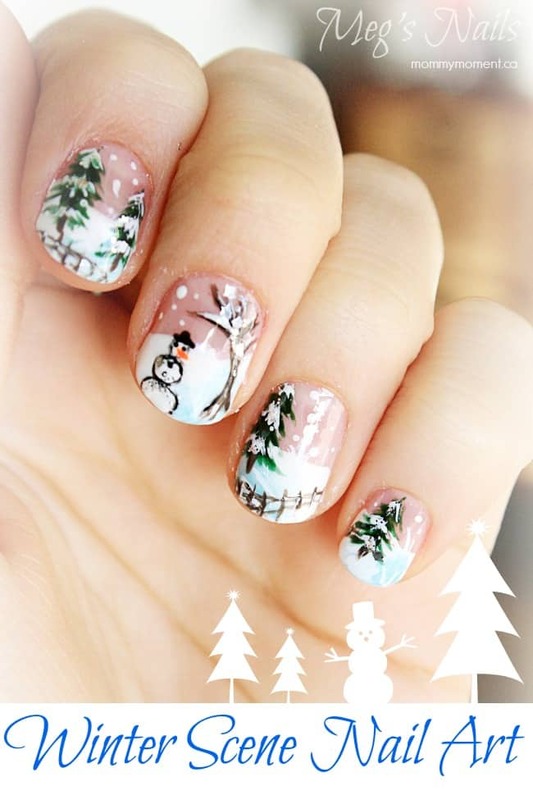 I get so excited to paint winter scenes on my nails once the snow starts falling and I have a design that hopefully helps you get excited for winter too. This winter scene nail design was actually inspired by a picture I saw on Pintrest and I just added a bit of my own flare to it. Once you get the knack for painting the evergreen trees this design becomes fairly simple. Just make sure you have some thin tipped brushes because those trees will not turn out well with the thick brush that comes in most bottles. Once I had finished my scene I looked at it and thought that it still wasn’t quite done. At that point I added some sparkles! The little bit of sparkles I added to the snow on the trees really finished off the look and I was very happy with the result. I hope you all can find the beauty in winter this year and not let the cold get you down! omg that is absolutely amazing! pure talent right there. i am lucky enough if i dont go outside my nail with painting them lol. very festive love it! Meg I am always so impressed with what you come up with !! These are really so adorable! Wow, now that is a talent! Wow that is so pretty. I used to do my nails but haven’t for a long time. I wish I had the time or patience. They are absolutely lovely. Oh WOW!!! These are beyond amazing 🙂 That is some talent!! Very fun and festive, well done! I just love the nail art and you are so talented, with the nail being clear it almost looks 3d, love it!! These are so sweet. Delicate and perfect. Great design! I love seeing your inventive art works. This is an adorable mani! You have a lot of artistic talent! I can’t believe you can do so much detail on such a tiny space.